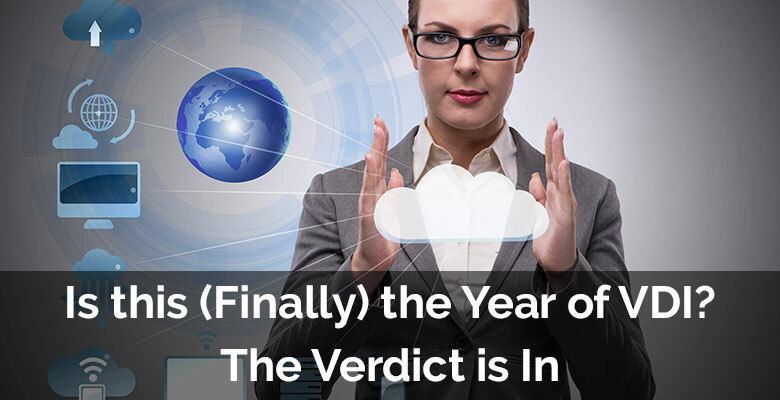 In last week’s blog "Is this (Finally) the Year of VDI?" I talked about how VDI has struggled to live up to its many promises and explained how security benefits and performance boosts from HyperConvergence are making VDI an attractive option to secure and support end users. Is wide scale adoption about to happen? Is 2017 finally the year of VDI? Read on to find out! Just-In-Time Desktops: One of the coolest recent developments is Just-In-Time desktops. While Citrix and VMware both had “on-demand” VDI options, those desktops still had to be provisioned ahead of time, ensuring that sufficient “buffer” VDI instances were available for users to log onto. Because of the length of time required to provision these machines, the buffer had to be relatively large, with many idle machines taking valuable CPU and memory resources from those machines actively being used. Technologies such as VMware Instant Clones use VM “forks” to reduce the provisioning time to seconds, allowing you to have a much smaller buffer of machines and better utilization of your resources. The technology is still relatively new (it was only in the 7.2 release that Instant Clones could re-use Active Directory computer accounts), but the potential is tremendous. There are, however, some limitations, the biggest of which is that all Instant Clones are non-persistent. This means that users effectively get a new desktop during each logon session and any sort of user customization or persistence will need the addition of another tool on top of your VDI deployment. I’ve found great success with tools such as Liquidware’s ProfileUnity and VMware UEM, which give users the feeling that they are always logging onto the same desktop, even though underneath, the machine is destroyed as soon as they log off. This is often paired with application layering technologies to simplify the management of gold images and the applications themselves, including any sort of licensing restrictions that may exist. For this, Unidesk remains the gold standard, but other technologies are quickly catching up and I think you’ll see a big shakeup in this sphere within the next few years. Is 2017 finally the Year of VDI? I would certainly hope so or at least argue that it’s the year to give it serious consideration as the major objections that have held it back are fading away. The technologies are at a point where VDI is viable and cost-effective, and most importantly, secure. If you’re ready to take a closer look at VDI, Daymark can help. We can help you navigate and simplify the complexities beyond the primary VDI environment. We’ll walk you through considerations on how to back up your VDI environment and implement a revised DR strategy. With a centralized desktop environment, new strategies for backup and DR become available, but also become more critically important. These sorts of questions must be asked and answered before a successful VDI deployment. Please contact me or call us at 781-359-3000 if you’d like to see how you can realize the promise of VDI, making your life (and your end-users’ lives) easier and more secure in the process.